NATO Vets Newsletter I am told by Doug Brunton that the NATO Vets Newsletter will because of workload have to be put off for a couple of months- the idea has not been shelved –i,e. with HQ and Regional input but finding someone with the time has bit us back till probably the beginning of our new year 2012. Annual General Meeting. By the time you get this we will have had our first AGM on Monday the 31 Oct at 1130. Remember the last one AGM was held almost three years ago -in Thom’s basement with 6 people at Fredericton. Our first year was “Survival”-our second year “Organizing coast to coast” – next year we will be “in business”. This time we are trying an AGM AND balloting coast to coast electronically – with as many people coast to coast as we can. The days of flying people in for a NATO Vet Org Convention/parade and AGM are long gone. We want to give as much time as we can for regional input. The feedback from the Regions was excellent –particularly on HQ Execs method for balloting!! “Trial and error ”– we will change and improve next year! Membership will be the focus next year – first “helping Betty” to streamline our Membership List – then quickly followed by a letter to members for dues submission – then a membership recruiting campaign. Advocacy Report You will now have seen the position we have taken on Advocacy. that we must now dedicate our efforts to changing these policies to ensure that Post Korea Veterans, so called Modern Day Veterans, receive the full benefits of medical care, commencing with Long Term Care. We want to advise VAC that NVOC will be undertaking an information and advocacy campaign to this end. VAC will always be advised and we promise no surprises or “media ambushes” on what we, NVOC, are doing. NVOC will now, through our headquarters and regional offices, will be contacting our local MPs /MMPs and the media on the subject of lack of provision of long term care unless a member is under a full disability pension. We are now working with or coordinating our efforts with CAVUNP/CVPA and Gulf War Veterans as peers – the Minister of VAC refers to us as the Four Musketeers. 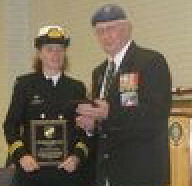 That is it for now – 2012 will be the year we “go into business as a modern day veterans organization”. With regions and HQ working in tandem we can do it! As the National Council of Veteran Associations (representing 58 member-organizations) gathers for its annual meeting on November 3rd, its focus will be on the declared intention of the Government that many Federal Budgets are to be potentially reduced and that substantial financial cuts will have to be exercised by individual Departments, including Veterans Affairs Canada. NCVA has recently written to the Prime Minister expressing its serious concerns in regard to this announcement, in that it would be highly unacceptable to us that the Government's Deficit Reduction Plan would conceivably include cuts to veterans' benefits or administrative components of VAC programs. We also trust that these cuts will not be made on the backs of the Canadian veterans’ community, particularly given the fact that a number of Allied countries, in attempting to cope with current economic deficits, have exempted veterans’ benefits and services from their proposed austerity programs. NCVA has consistently pointed out that, although Canada's Traditional Veterans are aging, VAC continues to have significant responsibility to the more than 150,000 veterans who served Canada during the Second World War and Korea. Many of these veterans are presently suffering from their service-related disabilities together with other medical concerns brought on by the ravages of age. It is also quite self-evident that extensive financial and human resources are required of the Department due to the influx of disabled veterans returning from Afghanistan and earlier Canadian military missions. Given the physical, mental and psychological concerns confronting these returning veterans, the job of VAC will become more essential and intensive in order to address these multifaceted problems. It remains our view that VAC has an important and complex mandate and, indeed, is entering a significant phase. VAC currently administers two major pieces of legislation – the original Pension Act for the Traditional Veteran and the New Veterans Charter for the Modern Day Veteran. At the same time, health care benefits, Veterans Independence programs (VIP) and all of the related policies are administered by the Department for all Veterans and their families. It is also a stark reality that should VAC’s budgetary capacity be impacted, the Department will be unable to fund crucial legislative improvements in order to fulfil its ongoing commitments to the overall veterans’ community. With reference to Traditional Veterans, there remain serious outstanding concerns as to the significant gaps in the VAC Long Term Care Program, inequities in the Last Post Fund/Veterans Burial Regulations and anomalies in the VIP programs for widows. In relation to Modern Day Veterans, the New Veterans Charter, considered a “living document” by veterans’ organizations, is currently an unfinished work in progress. A study of the Charter was completed by a VAC Advisory Group (of which NCVA was a member) over a three-year period and a report forwarded to the Minister of Veterans Affairs in the summer of 2009. The Advisory Group, made up of leading experts, practitioners, academics and veteran stakeholders, concluded that there remain a number of substantial gaps and voids in the Charter which require further legislative and regulatory amendment. It remains our strong position that the debate is not so much a question of whether the “lump sum payment” is a preferable approach to the original Pension Act, but whether the entire package of programs established under the Charter is sufficient to meet the needs and requirements of the Modern Day Veteran. We are convinced that without the implementation of changes recommended by the New Veterans Charter Advisory Group and endorsed and supplemented by the Standing Committee on Veterans Affairs, the Charter fails to fully satisfy these fundamental criteria. We would acknowledge that the Government, through the passage of Bill C-55 one day prior to the calling of the Federal Election in March of this year, has established a first step in addressing these Charter deficiencies. As a major representative of many of the Traditional Veterans organizations with members suffering from serious disabilities, NCVA spearheaded the recommendation that the Charter should be augmented to consider the plight of the Canadian Force member who is medically disabled with a catastrophic injury. There is no doubt that the plight of the seriously injured private together with other seriously disabled veterans deserves special attention insofar as the financial compensation available under the Charter. The addition of a catastrophic allowance and the enhancement to the Earnings Loss Benefit and Permanent Impairment Allowance will provide a start to improving the financial picture of these seriously disabled veterans. NCVA maintains, however, that there is much more to accomplish in bolstering the Charter and that the Government needs the budgetary resources to fully implement the recommendations of the Advisory Group and the Parliamentary Committee. The SISIP (Service Income Security Insurance Plan) long term disability program should be eliminated to remove the insurance culture constraints presently contained in the Charter. The Earnings Loss Benefit should be increased to 100% of pre-release income and in relation to permanently incapacitated veterans, be paid for life (not terminated at 65, as is currently the case). In addition, the projected career earnings of a Canadian Force member should be employed as the standard for the payment of the Earnings Loss Benefit. The Lump Sum Disability Award should be increased commensurate with the general damages paid by the Canadian Courts. In addition, a comparable evaluation should be carried out as to the parallel benefits paid by Allied countries such as the United Kingdom and Australia. Educational benefits should be expanded to bolster the rehabilitation provisions of the Charter so as to address the vocational and occupational constraints faced by many returning veterans with serious service-related disabilities. The restrictions and complexities of the Permanent Impairment Allowance guideline should be addressed so as to allow greater numbers of disabled veterans to qualify for entitlement for this important allowance. In order to recognize the caregiving requirements that many disabled veterans confront to cope with their incapacities the Attendance Allowance provisions of the Pension Act should be added to the Charter in recognition of the financial costs faced by many families in this context. The Charter should acknowledge that veterans with dependants should receive a higher level of compensation, either through an augmentation of the Lump Sum Disability Award or an increase in the Earnings Loss Benefit for such veterans and their families. Given these significant concerns, this is clearly no time to be suggesting any diminishment in the budget or the resources of VAC. In our judgement, the financial responsibility and debt of gratitude that all Canadians owe to Traditional and Modern Day Veterans should remain a paramount consideration in any evaluation of a Federal Deficit Reduction Plan. With reference to a specific examination of the VAC budget, NCVA has for many years argued that administrative efficiencies can be established within the Department through the removal of bureaucratic red tape and procedural obstacles which unduly generate financial costs to VAC. Subject: OVO Town Hall meeting October 20, 2011. According to the Veterans Ombudsman web site and also listed in the Carter of the OVO it reads: That the vision of the Veterans Ombudsman office will be the rallying point for Veteran issues. That he was not prepared to spend million of dollar and staff resource to investigate this non-Veterans issue. After being rudely interrupted on numerous occasions, I finally, through persistence, explained to him and the audience that the CPP clawback does not affect all Canadians. In that his office received two formal requests to investigate our Veterans annuity issue and that our Issue is considered to be a very important one to Veterans and their Families. We have received the support of over 112,500 supporters, which includes the support of 54 Former Generals. They can’t all be wrong! 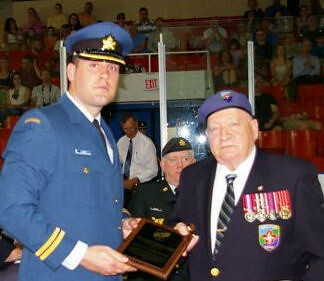 Supporters of the “Military And RCMP Veterans’ Campaign Against Annuity Reduction At Age 65” who feel that they are being unfairly penalized because of the Superannuation reduction at age 65 are encouraged to write and/or contact the Office Of The Veterans’ Ombudsman (OVO) and request that he initiate a formal review of this policy. Lets make it a systemic complaint! A BCC copy to the undersigned would be appreciated! Canada’s Heroes should be treated with dignity and never left to walk alone! Subject: Veterans' Week 2011 - Order Now! St. John Ambulance in B.C. has recently launched a program called The First Call Medical Alert Program. It is a way to support seniors living independently by keeping them safe and connected 24 hours a day, seven days a week. Our program consists of a 2 way voice transmitting panel with personal help button and fall detector, education and information on fall prevention and home safety, a first aid kit and $30.00 LifeLong Learning gift certificate that can be used toward any course St. John Ambulance offers. The 2 way panel connects through the land phone line to our monitoring company SecurTek located in Yorkton Saskatchewan. When the personal help button is pushed, the monitor can communicate directly through the panel, without the need for the person to pick up the phone, the range is 400 feet. The fall detector is attracting a lot of attention, because if it realizes a fall, it can communicate with the panel without the need to push any button! We have been very well received by our local health authorities, arthritis associations, community and seniors groups as they see our program as a way of re-enforcing their own falls prevention initiatives. Falls are a huge issue with the aging population, but any emergency will be attended to, not only medical, so if smoke is smelled or someone is at their door they are uncomfortable with, they can push the button and help will be called on their behalf. There are too many seniors living alone without support, being involved with the Medical Alert Program I see and hear about it all the time. I am excited to tell you there are no financial costs to the Veterans, as this service is covered by Medavie Blue Cross. All we have to do is supply Medavie with the Veterans names, addresses and Veteran Number. Once approved, St. John Ambulance would go into the Veterans home to install and go over the information I have referenced above. Not everyone will want the service, but if we can prevent one person from falling, or can get help right away if a fall does occur, we will all be better off. Lying on the floor for more than one hour is strongly associated with serious injury, admission to hospital and subsequent moves to long term care. And the cost to the healthcare system is staggering, currently at 2.8 billion dollars. I live in North Vancouver and see the old Anavets buildings are being replaced. Wouldn’t it be wonderful to offer this incredible service to them as they move into their new homes! A lovely, modern building on the outside, and this added layer of reassurance on the inside. I would really appreciate being put in touch with a contact person in Vancouver to explore this further. 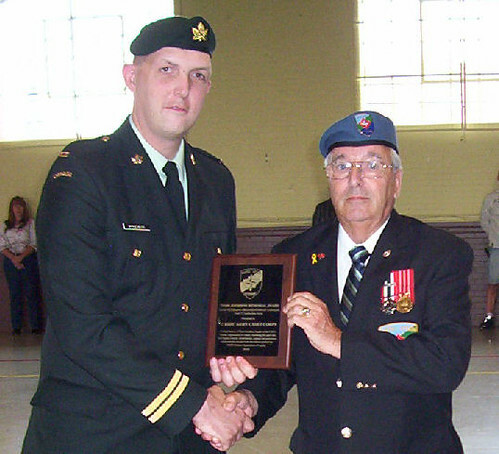 My dream is to offer the service to all your Veterans across Canada, but one step at a time. The official court information by Mr. Dennis Manuge is enclosed. You are been advised that the SISIP legal class action suit will resume in Halifax on November 16, 17, 2011 at the Halifax Federal Court. The purpose of this letter is to request that you attend the proceedings and demonstrate support to Dennis Manuge and disable Veterans with their quest for disability pension financial justice. Veterans, please mark these dates on your calendar, wear your medals and show the Public and the Court that we support our disable Veterans and their families. We do not accept the unfair financial burden they face on a daily basis. Suffice to say that the presence of Senior Officers with medals in support of disable Veterans speaks for itself. There are many excuses for not attending far too many are not worthy! 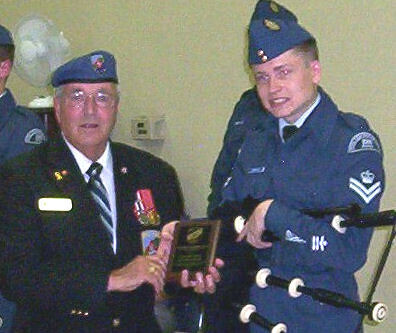 Disabled Veterans are Canada’s Heroes, they almost gave it their all. They stood up for Global Civil rights, when they return home they should not be required to fight for their rights of equality. Surely the enormous profit that our SISIP plan generates can be redistributed to our National Heroes disabled Veterans! Veterans are Canada’s Heroes! They should be treated with dignity and never be left to walk alone! I continue to receive and read your posts, and as some do not refer to my situation in particular, I do want to contribute when I can. I do want to thank you for sending me regular emails on matters of such importance. I will try to explain my situation and then we can move on from there and you can let me know what you think. Maybe some of your friends at higher levels may want to hear how the NVC affects a veteran in my, maybe unique, circumstances. I had service related injuries in 1987 and was medically released from the CF January 2, 1996 for those injuries. I was denied disability pensions from the Canadian Pension Commission - August 8/1995, VRAB–Entitlement Review July 31/96, and VRAB – Entitlement Appeal – Feb 12/97. In late 2006, I was accepted, after a long battle with VAC, for Rehab – ELB. Shortly thereafter, and after more medical evidence surfaced, I was declared “Totally and Permanently Incapacitated” TPI from VAC. ISSUE: In 2006, VAC made a decision I am “Entitled” because of “Service Related” injuries to REHAB / ELB, yet I was not in receipt of any pension under the NVC or the Pension Act, why and how is this different under the two legislations? ISSUE: VAC made a decision in 2006 that I am “Totally and Permanently Incapacitated” (TPI) because of my “Service Related” injuries, yet I was not in receipt of any disability pension under the NVC or the Pension Act why or how can this be? There is something wrong with the system when this type of decision making process is allowed to occur. TPI means that I am no longer able to be retrained in the workforce because of permanent disabilities. Because I was in receipt of REHAB / ELB, most if not all of my entire (3) years of retroactivity pay (decision under the Pension Act (2005 – 2008)) was Clawed Back to April 2006. I was left with an extremely small amount which is not worth mentioning. The clawed back or (offset) amount resulting from a Pension Act award was made because I was receiving ELB, and is between $ 50,000 and up to $ 100,000. The exact amount can not be determined as the issue is ongoing. ISSUE: VAC finally renders a decision, of my 1987 injuries in 2008, (instead of prior to 2006) and they recoup all the money paid because of ELB. Is this fair, obviously not, is it legal “questionable” until I pay more than $ 50,000 to a lawyer to find out the answer. Again, I lose. What a racquet! Chronic Pain Disability 4/5 – Entitlement @ 45% disability, a (35%) payment under the NVC. After, the normal deductions were made, I ended up with about $ 65,000.00 that I received from VAC (NVC award) of 35% disability. I placed this money in the bank because I can not spend it or use it to pay my debts because maybe at some future point a decision may be made to have the decision put under the Pension Act where it will be “Clawed Back” again or taken off any future Pension Act payments and I would not benefit from it use until I am let us say I was 103 years old. ISSUE: I had service related injuries in 1987 and was medically released from the CF January 2, 1996. I was denied disability pensions from the Canadian Pension Commission (CPC) - August 8/1995, VRAB–Entitlement Review July 31/96, and VRAB – Entitlement Appeal – Feb 12/97 for the exact conditions and received a decision for between 1994 – 1997, WHY DID I RECEIVE A DECISION UNDER THE NVC and not the Pension Act? How do I have this decision changed to be under the Pension Act with a monthly annuity and out of the NVC? There is no logical reason for denying me “Vested Rights” for injuries that occurred in 1987 and especially when I was medically released from the CF in 1996 for those service caused injuries where a decision was rendered in 1995, 1996, and 1997. I won a Judicial Review in 2009, where the Judge ruled the original VRAB decision of 2008 was “Quashed”, I paid a private lawyer (10’s of thousands of dollars) to represent me at the Judicial Review, and then at the November 10, 2010 VRAB (Federal Court of Canada Ordered rehearing) original 2008 VRAB decision for Thoracic and Lumbar Disc Disease. In the November 10, 2010 VRAB decision, (the Federal Court of Canada Ordered rehearing), the VRAB increased my Entitlement from 1/5 to only 3/5th. They should have ruled 5/5 Entitlement from the beginning. My service medical records were “not ordered and/or not used” by the Bureau of Pensions Advocates from 1994 – 2008 and this is why I was not given a pension in 1996 at the time I was medically released and disabled from the CF. All of the 1994-1997 disability applications and decisions were made using only 3 medical records obtained by the Bureau of Pensions Advocates on my behalf when there was a total of 2238 medical records available from ATIP. “There is no evidence what so ever that you are disabled and that your injuries are service related” therefore we must rule unfavourably. The 2008 VAC favourable decisions for cervical, thoracic, and lumbar disc disease we made based on ALL 1987 service/medical records that were eventually made available to the “Decision Makers” in 2008 but not in 1994-97. Why not? There was a CF-98 confirming all facts of the injuries but the VRAB ignored that evidence and or gave it a discretion value of (0) zero weight factor. Why is the law being violated by the VRAB? The Minister of VAC (then Minister Thompson) was sent (2) Ministerial Inquiries in which he took about 1 1/2 years to respond only to let me know that he passed it on to the Chief of the BPA to answer. The Chief of the BPA called me directly at home, by telephone, not even by correspondence, and “bluntly” told me that he would not respond to any issues or matters in my Ministerial Inquiries, most likely because the BPA is guilty of negligence. Firstly, I received a "$ 100.00" (one-hundred dollar) increase in my monthly disability pension amount & a $ 1200.00 per year increase in my pension check. It will take me 33.33 years of receiving disability payments (now I am 50 years old, I need to live until I am 83 years old), before I can benefit from receiving this money for my service caused injuries and disabilities because I paid for my lawyer. I just want to say, Thank You Canada, but NO thanks it costs me too much to be injured for my country and on the job in Canada. However, it is now too late as I already paid my lawyer his money. If I die before age 83, Canada wins more money, wonderful scam (sarcasm). Secondly, the VRAB “back dated” my retroactivity of the new November 10, 2010 decision back to a date in 2009 when I made an appeal application to the Federal Court of Canada. The VRAB DID NOT “back date” my monetary retroactivity back to the original 2008 date made by the previous VRAB Reconsideration hearing of October 13, 2009 where they set my “retroactivity” back to 2005 and under the decision was made under the Pension Act. ISSUE: If the original date of application was June 20, 1994 and the VRAB ruled on it in 2008 in which I appealed it to the Federal Court of Canada, my effective retroactivity should remain my original VRAB decision date of 2008 and (3) three years prior which is when I was originally granted the first “Favourable” VRAB Reconsideration decision. I was in fact appealing that 2008 decision in the first place, so why is my retroactive payment from (3) three years prior to the date of my appeal to the Federal Court of Canada and not the original 2008 VRAB favourable decision date which was already granted entitlement and retroactivity back to 2005. I am sorry if these technical issues sound like a rant. I simply want to someone of power to notice other ways in which our veterans are losing money from the inadequacies of the NVC and acts on these morale wrongs. The facts herein are meant to highlight a few more examples of where and how many of our disabled veterans are being fraudulently (swindled) out of their “Vested right” to disability pension benefits despite the clear legal obligation by the government of Canada to comply with Pension related Acts and other legislative requirements, and I for one have run out of money to fight them. Now, I have to decide if I want to lose my house so that I can have a small chance to win in a civil lawsuit. By the way, lawyers for vet’s through the Ontario Trial Lawyers Association would not assist me at this level. In hopes that someone hears our calls for help and can do something about it. I am just simply too tired, to frustrated, and too broke to do anything about it anymore. It is with great pleasure I tell you today that the historical designation &8220;Royal Canadian Air Force (RCAF)” is once again the official name for Canada’s air force, replacing the designation air command. Please join me in celebration of this historic event, which recognizes and honours our military history and heritage, and pays tribute to those who have gone before us. Once the announcement is made, you can proudly say you are a member of the Royal Canadian Air Force. 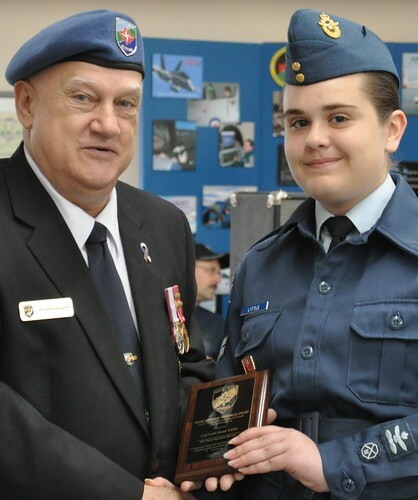 After an invitation and attending a local cadet group's annual spring review in June of 2010, the thought of getting NATO Cambridge Area Unit 5, involved with cadet groups in the surrounding communities by developing and implementing some sort of award. I felt this would give the NVOC and Cambridge Unit 5 exposure and broaden the public view to the Organization and who we are. I suggested the idea to the unit 5 members at a meeting in the fall of 2010 and asked them to think about it over Christmas and we would re-visit the subject again at our first meeting in January 2011. I asked the members to come up with suggestions of what to name the award. How many cadet groups could we manage financially? What groups would we select? 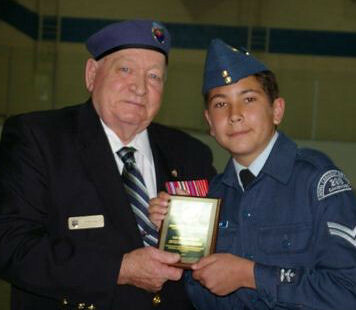 What would be the qualifying control factors needed for a cadet to be selected for the award? Who would judge the award winning cadet in each group? During this time I discussed the subject with my idea sounding board (Maddy) my wife. 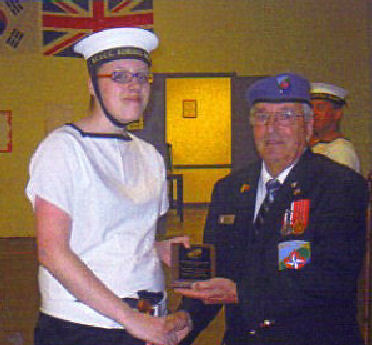 She suggested, why not develop an award in the memory of the NVOC founder Thom Joordens. I took this suggestion the unit meeting and the members like this idea. Three members at the meeting, made combined donated $100.00 toward the cost of some six 5x7 inch plaques. Details came together very quickly, one member suggested the award be named the "Thom Joordens Memorial Award." I formed a six member Award committee that included the unit executive, and the members that had made the cash donation plus the unit PRO. By the end of February six cadets group were selected. It was decided that cadet groups in communities where members of unit 5 reside, would be the area that qualify for the awards. I took the responsibility of arranging a meeting with the Officers of each of the cadet groups, by attending their parade night and meeting with them with a complete package and a verbal explanation of what the eligibility was to qualify for the award. I asked them to submit a cadet name me by the end of April of 2011, so as to have enough lead time to complete the engraving of all the plaques. I also asked them when the date of each Corps review was to he held and to send the unit 5 an invitation to the event. 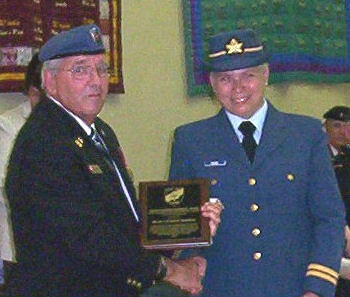 Unit 5 member would attend to present the award. Photos of each presentation were taken for a NVOC Unit 5 as a visual record. Comm Officer to Capt. 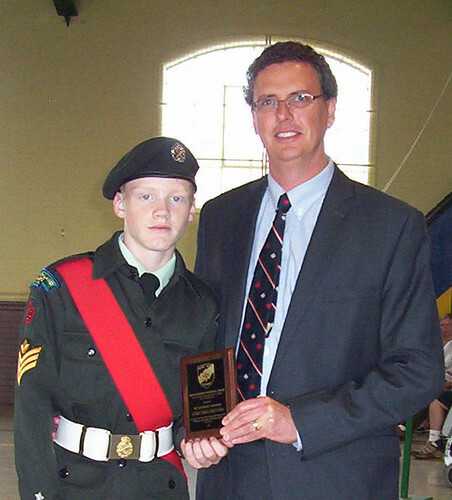 Bryan McKenzie 21 RHFC Army Cadet Corps Cambridge, Ont. 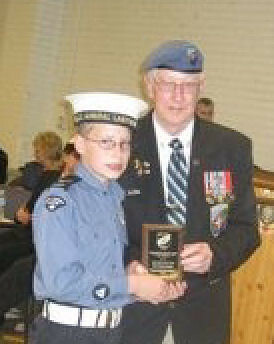 Cadet M. Cpl. Daniel Lonergan 21 RHFC Army Cadet Corps, Cambridge Ont. Comm Officer to Capt. Patrick Verriet 296 City of Cambridge Sqdn. RCAC Cambridge, Ont. Comm. 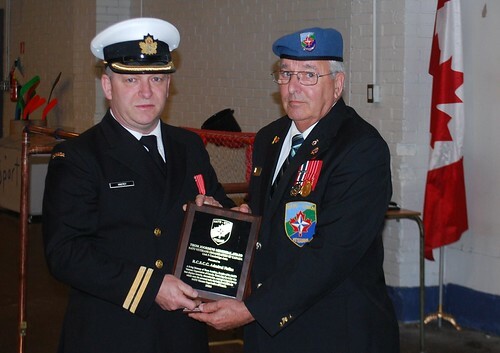 Officer Randy Anstey RCSCC Admiral Nelles, Brantford, Ont. Cpl.Lori Anne Little, 822 Tutor Sqdn. Rcac Breslau, Ont. Comm. Officer Capt. Dorean Bone 136 Kiowa Sqdn. 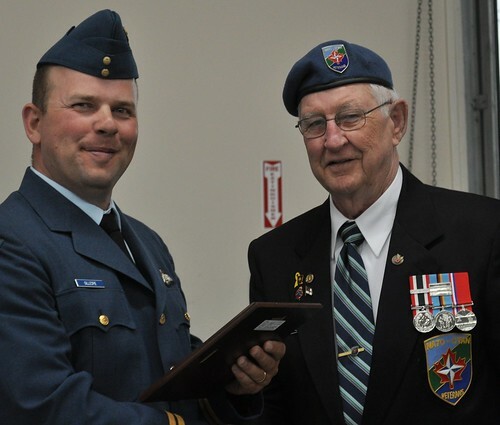 RCAC Ayr, Ont. F Cpl. Andrew Roberts 136 Kiowa Sqdn. RCAC Ayr, Ont. Gerry Bryan CD - NVOC Cambridge Unit 5 President. The passing and Royal Assent of Bill C-55, this week, is the culmination of our collective efforts and it is with great pride that I thank our partners of the Veterans’ Consultation Group for their participation and support throughout this process. Because of the cooperation we have shown amongst our organizations, and our joint commitment to improving services and benefits for Canadian Veterans, we have made tremendous inroads in ensuring that the New Veterans’ Charter remains a “living document” as was once promised by the Canadian Government. To those who participated in the Royal Canadian Legion’s recent letter-writing campaign, there is no doubt that this additional contribution made a positive impact on the government’s decision to push this legislation forward prior to a potential election. It is by taking these types of proactive steps that we ensure, both as Legionnaires and as partners, that the needs of our Canadian Veterans are met. We must continue our work together to advocate further changes to the NVC with the prevailing government and I am looking forward to collaborating with you, my Friends and Comrades, in the near future.